We’d love your help. 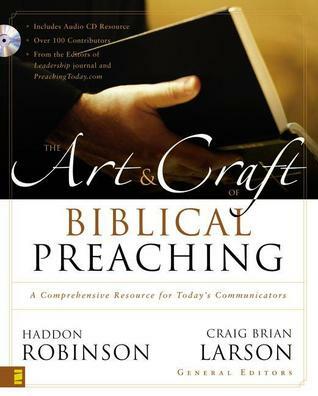 Let us know what’s wrong with this preview of The Art and Craft of Biblical Preaching by Craig Brian Larson. To ask other readers questions about The Art and Craft of Biblical Preaching, please sign up. The book is composed of topical articles. Very accessible if you are looking for particular needs. Not all pastors or preachers are they type that I would look to for modeling, so take some and leave some. Some really great articles. Some of the sections are more helpful than others but there is not a dud among them. Will refer back to it often I am sure. This is the MOTHER of ALL Preaching books! It's a collection of essays from all the preaching greats out there. Must have! Almost all of these articles are short enough to be read quickly. I read them as a devotion this year and many were very good and very helpful. I probably will come back to this book from time to time. I would highly encourage others to read this book. This is a fantastic resource with articles from leading communicators in the church. Anyone who finds themselves preaching would benefit greatly from this book. John Beaukema's chapter on using humor is particularly commendable. This book suffers from its strength, a huge array of widely disparate contributors. Craig Brian Larson is chief editor for Christianity Today's PreachingToday.com, an online journal and illustration service. He also pastors a church in Chicago, Illinois. His books include Contemporary Illustrations for Preachers, Teachers, and Writers; Preaching That Connects; and The Art and Craft of Biblical Preaching. He and his family live in the Chicago suburbs.